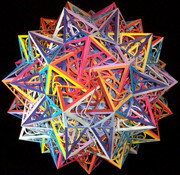 This is the sixth stellation of my model of the great snub dodecicosidodecahedron, which is No. 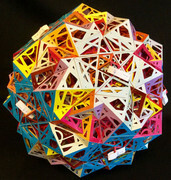 115 in Magnus Wenninger‘s book „polyhedron models“. Nine further stellations are to come. The edge length will be 30 cm. 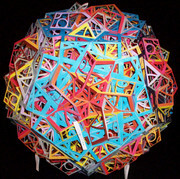 There are 15 colours, 6 for the snub triangles, 5 for the icosahedral triangles and 4 for the pentagrams. Looks great! Must take a long time. Looking forward to the finished model. Awe-inspiring! What will the radius be? I've seen several of your models in the past, but previously, I've only considered the holes in the faces to be decorative. Having spent a few minutes studying the current image, I see that the holes also permit a better appreciation of the structure of the polyhedron. They allow you to observe the intersecting faces in a similar way that the models with natural holes (like W 63) do. This might be an alternative to using transparent sheets. I guess I'd need a laser-cutting-thingy though (are you listening, Santa?). The diameter will be 396 mm. You‘re right, the pattern is based on the stellation diagram. A laser cutting machine works well and can accelerate the process a lot. I could gather some experience in the past. The results are very precise but a little „sterile“. And although it can be rather painful, I love cutting the paper by hand with my scissors and knives.